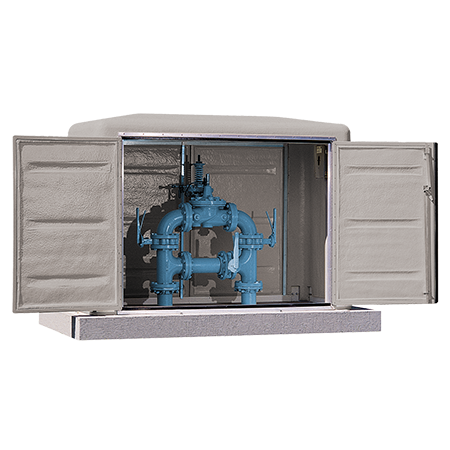 Gorman-Rupp's Valve Vaults are compact, weather and vandal resistant custom engineered systems ready to perform a variety of valve functions. These above or below ground units can house pressure reducing, surge control or altitude valves, or flow meters. The above ground enclosures are made of corrosion, mildew, fungus and mold resistant fiberglass and have access doors on both sides to ease inspection and maintenance duties. The below ground units are constructed from durable pre-cast concrete and, like the above ground systems, are impervious to the elements.